My, what a difference a year can make. Just 12 months ago, pundits were rushing to declare the PC’s death, and wielding word shovels to bury Computex—the premier PC industry trade show—alongside it. There was valid reason for concern! PC sales haven’t exactly been exploding recently. Big-name PC vendors like Acer and Asus spent almost more time showing off smartwatches and smart home gear than actual computers at Computex 2015. Intel and Microsoft’s CEOs didn’t even bother showing up. But rumors of the PC’s demise were greatly exaggerated. Computex 2016 was overflowing with all sorts of wild and powerful PC gear, as the industry pushed out next-generation hardware and form factors the likes of which haven’t been seen in years. The PC is back, baby. The PC’s resurgence can be chalked up to a few major reasons. Let’s get the boring one out of the way first. Over the past 12 months, it’s increasingly become obvious that we’re indeed living in a PC-plus era, rather than the post-PC world that so many pundits were keen to push. Sure, PC sales still aren’t growing, while the duration that people hold onto their existing PCs keeps getting longer. But that makes sense: Between Moore’s Law’s decline, the reality of our new multi-device existence, and the high price of PCs, computers have essentially become appliances for most people now. Here’s the thing, though: Tablet sales are dropping too. So is smartphone growth, especially in first-world countries where market saturation and the death of subsidized plans are beginning to set in. The world’s settling into a new technological equilibrium. The one bright spot in all this industry doom and gloom? 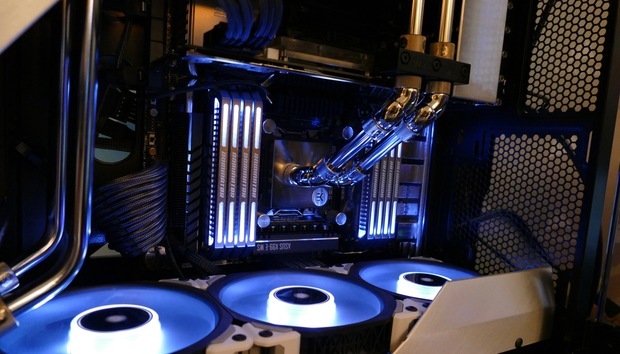 High-end PC hardware, where enthusiasts are still spending cash hand over fist. While the overall computer industry is in decline, gaming PC shipments keep growing at a healthy 26 percent clip, and for a damned good reason. After years of incremental upgrades, all sorts of PC hardware are suddenly pushing towards the future, all at once. The long-awaited birth of consumer virtual reality sparked a lot of the excitement. The industry’s still grappling with what’s possible with VR, and basically throwing stuff at the wall to see what sticks. But beyond the sheer novelty of exploring virtual worlds, the HTC Vive and Oculus Rift demand a hell of a lot of computing power. You can’t even start to consider building a VR-ready rig unless you’re willing to spend at least $350 on a graphics card, and $1,000 or more on your entire system build, not even counting the cost of the headset itself. Nvidia’s GeForce GTX 1070 outpunches the Titan X for $380. The graphics card industry pulled itself into the future as well. After being stuck iterating on 28nm processor technology for four long, grueling years, both AMD and Nvidia leaped forward two full technological generations with new cards revealed around Computex. Nvidia’s GeForce GTX 1080 is the most powerful GPU ever created, while the GTX 1070 delivers Titan X-level power for a price 60 percent less than the former flagship's. AMD’s Radeon RX 480, meanwhile, promises to deliver VR-ready performance on par with today’s $500 cards for just $200. And get this: All these new behemoths crush frame rates while consuming far less power than today’s graphics cards. The Radeon Nano’s funky mini-ITX form factor might just be a hint of what we’ll see when this new generation gets its sea legs (and the second generation of high-bandwidth memory). Intel’s Core i7-6950X, the first 10-core enthusiast processor. Meanwhile, Intel pushed processors to (pricey) new heights with its 10-core Broadwell-E Enthusiast Edition chip, and AMD’s Zen processor threatens to battle Chipzilla at the high-end again. Connection interfaces are finally becoming fast enough to perform thrilling new tasks, too. Even more awesome: System builders are innovating on the underlying innovations. Yep, that’s a GTX 980-powered gaming PC that you wear on your back. At Computex 2016, we witnessed all sorts of exhilarating PC form factors that turn existing paradigms on their heads, from VR-ready PCs you wear on your back to all-in-ones stuffed with Intel and Nvidia’s beefiest components to Asus’ wild reimagining of what DIY PCs can be. Even traditional computer designs are getting makeovers, as evidenced by mag-lev case fans and this Asus laptop with two graphics cards, two power supplies, and a friggin’ water-cooling dock. The Asus Avalon concept PC tightly integrates motherboard and case design to revamp PC capabilities and almost eradicate internal cabling. The wild motherboard (with plug-and-play daughter cards) that enable the Avalon’s design. Heck, Corsair’s army of awe-inspiring PC builds even included a computer that looks like Katy Perry’s infamous Left Shark. So no, the PC isn’t dead. Nor is Computex. For the first time in a long time, the PC industry is putting the technological pedal to the metal and becoming flat-out exciting again.